Last week we brought you news of Lewis Griffiths’ efforts to take part in this years London Marathon, well… he’s there’s, and he’s been spotted on TV too. 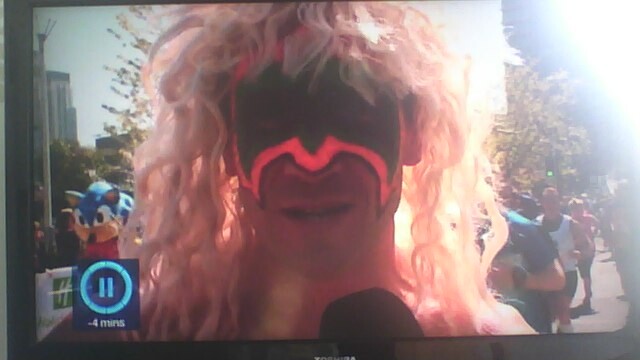 During a race side interview with The Ultimate Warrior. Sonic was able to just edge into shot as he overtook the famous wrestler. Based on various tweets and other comments on social media, Lewis has also been spotted by a number of other spectators and is causing a bit of a stir as he powers by. 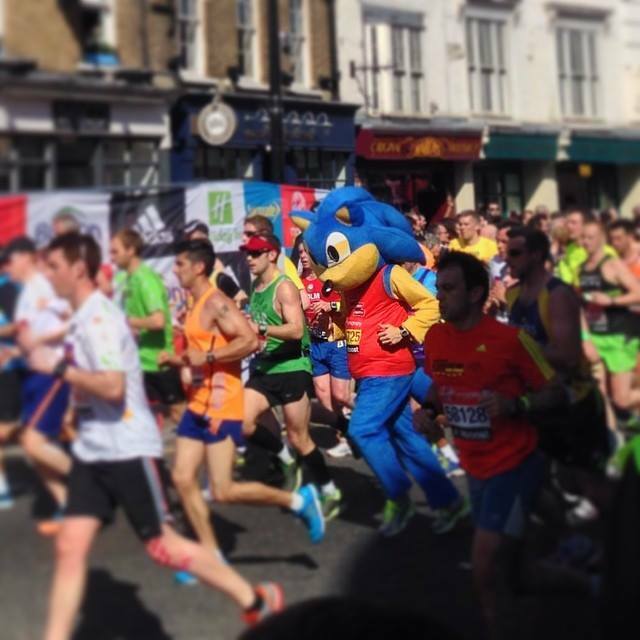 My favourite bit of this pic is the guy just in the back who has realised he’s been overtaken by Sonic the Hedgehog. From all of us here at The Sonic Stadium, Good show Lewis! Keep it up. Also if you want to donate to Lewis’ charity (Leukaemia Care) you can do so via his donation page. Special thanks to SSMB member Lucky for the tip and for spotting lewis in the half a second he was on screen! P.S. Based on current TV Footage, Sonic is ahead of the following… Iron Man, Spiderman, The Ultimate Warrior, Charlie Chaplin and a man carrying a giant tiger whilst dressed as a robot…? On February 23rd, the 13th annual SonicLondon event will be taken place, and Sonic fans aged 18 or over are invited to come along! What’s SonicLondon? 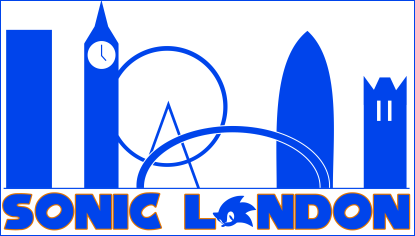 Well, Sonic London is basically a community meetup started by long time Sonic community member HelenBaby, who has been organising the event since 2010 and it’s grown in size and recognition over the years. Entry is free, but spaces are limited so make sure you confirm your attendance on the Facebook Page so the organisers have an idea as to how many are going to attend. 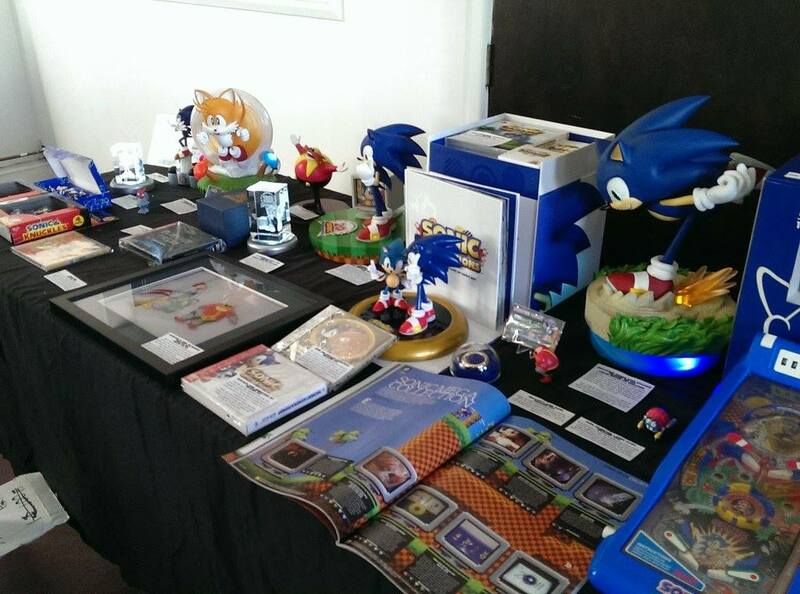 “Sonic fans over the age of 18 are invited to attend SonicLondon, a public meet-up of Sonic fans that takes place regularly in the UK capital. The next meet is set to take place in Meltdown London, an eSports bar in North London, on February the 23rd. Inspired by a bunch of Summer of Sonic fans talking about meeting up more frequently than the annual con, SSMB member HelenBaby went ahead and set up the group in 2010. The first meet-up was held shortly afterwards, and the upcoming meet will mark the group’s 13th gathering. The theme for the upcoming meet will be Sonic Lost World in celebration of Sonic’s latest adventure. As the last meet was also Lost World-themed this one will be deemed ‘Hard Mode’ in homage to the extra mode players unlock when completing Lost World’s main story. In addition there will be a competition at the event which will require a copy of the 3DS version of Sonic Lost World in order to participate. The other contests, however, are open to everyone. 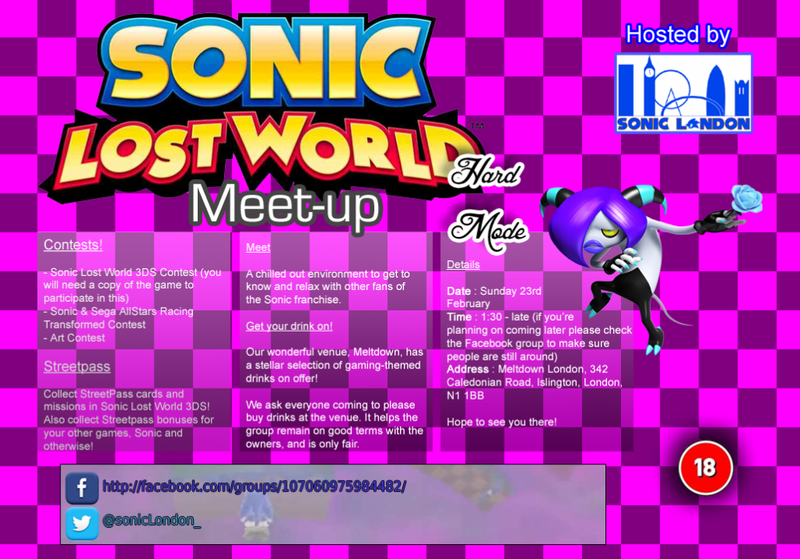 Also, just to clarify : despite Sonic Lost World being the meet’s theme it will still be a general Sonic meet, just like the others! Aside from the contests activities at the meet will include chatting, drinking (seeing as it’s held in a bar) and drawing (paper and pencils provided). 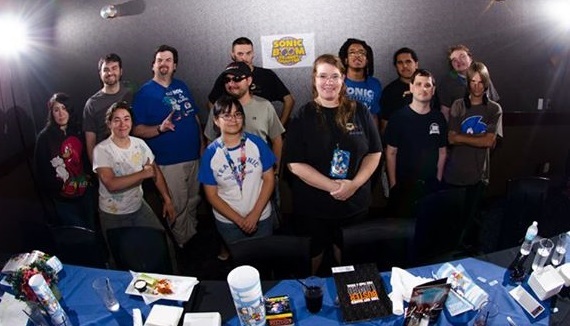 Back at the start of the year, you may recall how we brought you news of a new Sonic community meet up event? Well, unfortunately for me I was unable to attend, however SOS documentary maker Jono D was able to attend and has kindly documented the day. 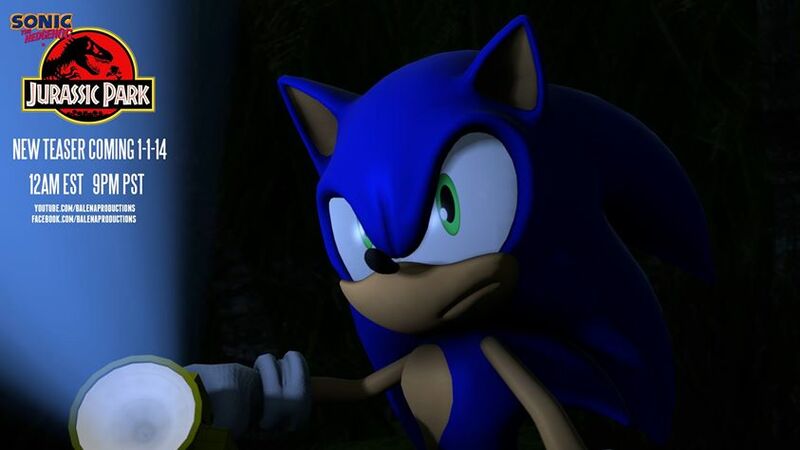 So the rest of this update will be done by guest writer Jono D.
“How many of you people know what Summer of Sonic is? A fair few of you? Good! For the uninitiated, The Summer of Sonic is one of the most prolific fan events in many Sonic fan’s calendars, attracting hundreds of people each year for a day of events, contests, community and most importantly, fun. You’d be forgiven then for thinking that the event has always been this way, however its origins are a lot more humble than some people may think. 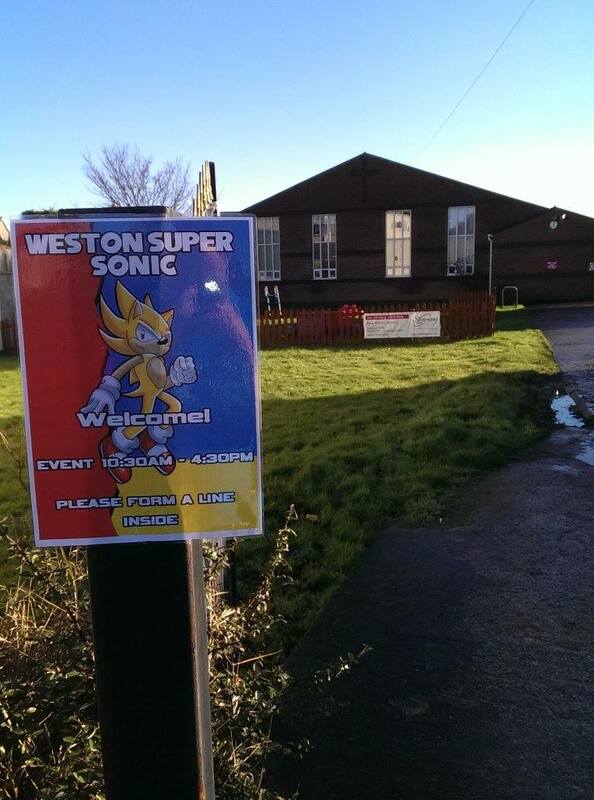 The event was started by a small group of community members who wanted to create a forum for people to come and socialise, meet each other face to face, and much in that same vain comes Weston Super Sonic. A local community church in Weston Super-Mare provided the venue for all things Sonical during the day. Weston Super Sonic is the brainchild of one devoted Claire Cameron. Already a frequent Summer of Sonic attendee, she had the idea of creating and hosting a Sonic community gathering much closer to her home in the west of England… So she did! 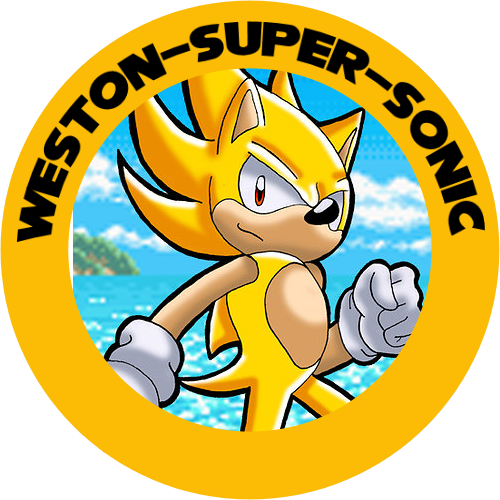 On the Saturday the 11th of January, Sonic fans descended onto the famous seaside town Weston Super-Mare for the event. Some even coming from as far as London! 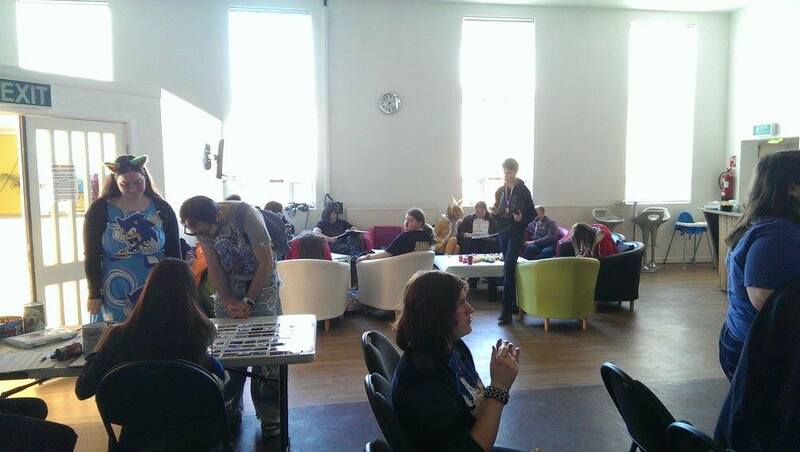 The floor space wasn’t massive, but everyone had space to relax and socialise. The day started off just after 10:30 in the morning in the small community church hall, which was the designated venue. There were a few areas inside; A set of chairs and a projector for multiplayer gaming events and tournaments, a seating area for drawing, relaxing and general socialising, and a table with a collection of rare merch on show for people to have a look at up-close which had been brought in for exhibition (AKA the corner I was looking after, and subsequently living in for the day). The far side of the room proved popular with fans that wanted to simply sit and enjoy the atmosphere. After everyone had gotten settled into the venue and had the chance to chat (as well as devour all the cupcakes that had been brought in), things kicked off with a small speedrun tournament of Sonic 1’s Green Hill Zone Act one. Fairly simple: Fastest time would win! The audience participation in this was awesome. Plenty of cheering for each other as well as giving each and every runner a round of applause at the end of their run. I even managed to have a go and ended up coming in second place, which is something I wasn’t at all banking on! 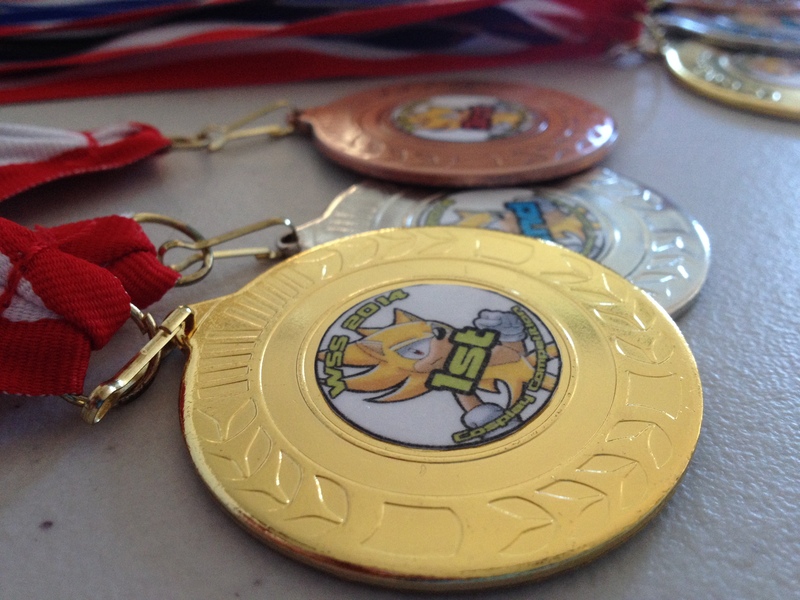 The top 3 ranking speedrunners were handed out medals for their achievements. The lucky winners of the various contests were all awarded medals for their achievements. The day then progressed casually with other small events throughout the day, including a costume workshop run by the host Claire, detailing how she went about producing her impressive costumes which were also on display for people to see. Everyone had the room to move and take everything they wanted to do at their own pace. Some people drew are for the art contest that was running, some played the consoles on offer in friendly head to head matches, whilst some simply sat and enjoyed each other’s company. With the small nature of the event, everything felt more relaxed and was a welcome change in pace from the normally frantic, upbeat and constantly active atmosphere found at Summer of Sonic. Claire’s homemade costumes were all on show, and played an active part in her cosplay workshop. A table of rare merch was on display in the corner. Complete with information cards for everything. One short happy-birthday song for host Claire later, The day neared its conclusion. The final medals were given out to the other competition winners and runners up, and the final gaming tournament of the day took place: a four-way battle on a mystery game… The audience when the competitors discovered it was Sonic Shuffle was worth it for their reaction alone! After a long battle of attrition on one of the clunkiest party games ever, the tournament finished up, the final medals were handed out and everyone packed their things, said their goodbyes for the year and headed for home. 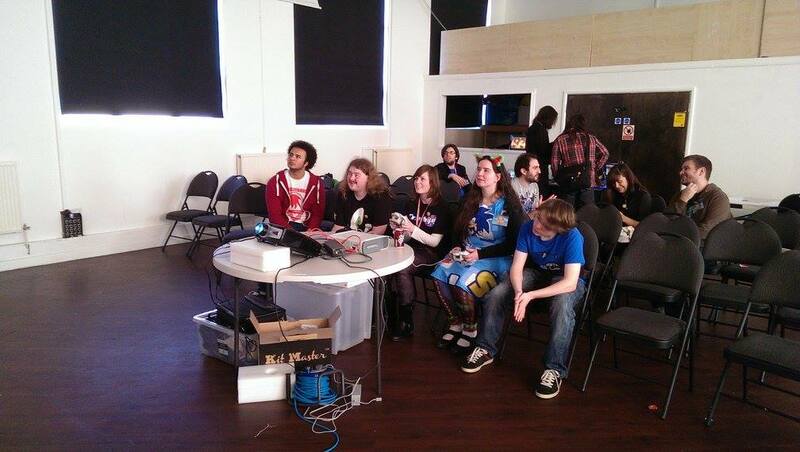 Everyone poised during the final rounds of the Sonic Shuffle tournament. And so concluded Weston Super Sonic. Everyone involved had a brilliant day, and even though I had mostly been grounded to my table in the corner, I met some truly great people from the immediate area who I had no idea were so nearby to me. Will definitely be getting in contact with again for local get togethers. Plenty of friendships were made on the day, with everybody looking forward to a new event next year. Weston Super Sonic may appear to be a humble Sonic the Hedgehog gathering on the surface, but this sort of small beginning harkens back to the Summer of Sonic’s early days where it was just some fans wanting to give other Sonic fans a day to remember, and with one event under their belts, what’s to say it can’t grow into something much bigger? With that, I want to give a big thanks and shout out to Claire ‘Rurifuu’ Cameron for having the not only the drive to want to do something for the fans, but actually going ahead seeing it through to the end. The turnout for a small Sonic get together was a brilliant surprise, and with words that Claire is already intending to host again next year with a bigger team to work with, we tip our hats to you Ms. Cameron! Now, who’s on board for a Sonic-takeover of Weston’s Grand Pier? Special thanks to Jono D for the write up. Yet Another Christmas With Sonic, by BalenaProductions! We are but a stone’s throw from Christmas now, and boy, what a year it has been for us! We ended up revisiting a remastered pair of classics of days past, special thanks to Sonic Retro community members Taxman and Stealth for a job well done. With new moves in our arsenal, we went and ventured across worlds unseen on the Lost Hex and took down the dastardly devious Deadly Six. Over the summer, Summer of Sonic and Sonic Boom brought people together to celebrate the 20th anniversary of all things metal and hedgehog like no other. Courtesy of Capcom of America for the pitch, Ian Flynn and the wonderful staff at Archie Comics brought Sonic and Rock together for a 12 part comic crossover of Mega proportions through Worlds Collide. The cherry on top, provided by the good folks at Hardlight Studios, came in the form of an endless runner called Sonic Dash for iOS and FINALLY Android devices, where players rose to the pair of Global Challenges issued and won! But for now, with the end of the year at our doorstep, it’s time to set all the adrenaline aside, sit back, relax, and roast some chestnuts over an open fire… or prepare some chilli dogs over an open grill… as we partake in a holiday tradition approved by jolly old Saint Nick himself — Christmas stories! And just like last year, we’ve got one of Sonic and the gang (including the likes of Tails, Knuckles, Manic, Sonia, Vector, Shadow… S…Stan…?) right here from our pals Steve and RianaLD via BalenaProductions! 9 days from now, a once time-honoured tradition on SEGASonic:Radio is set to return to its airwaves. Those who stuck around long enough will no doubt have heard of it – it is a sweet little day long marathon of DJs bantering around, quality music blasting from the speakers, and more. Coming round for its 5th edition, Project 24 has been a massive success in its runs and will go live on SS:R as soon as the bell tolls at midnight, December 15th GMT! Listeners are invited to tune in on this special occasion and chat with our esteemed masters of ceremony, especially if they are up for winning sweet, sweet prizes! 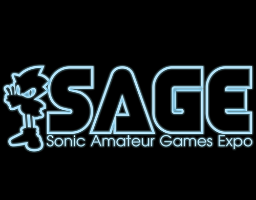 In the past, Project 24 brought together DJs old and new from the station’s history, but this year, things have been shaken up quite a bit, for not only will SEGASonic:Radio play host to this event once more, but it will be joined by friends and affiliates at RadioSEGA, Sonic Radio, and RadioNintendo as well! Here is the tentative schedule for the event – take note that it is not final and is therefore subject to change! More details will be trickling through the grapevine, so it would be in your best interest to keep tabs on the four stations involved. As head of SEGASonic:Radio and on behalf of the P24 crew, I hope to see you all on December 15th! Check back for frequent updates! After much anticipation, OverClocked Remix has released their latest collaborative work in the form of their 45th album, if only in hopes of finally putting the argument over “which soundtrack is the better one” to rest. And how did they plan on doing that? 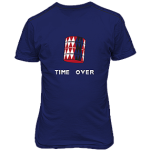 By going all out and paying tribute to both American and Japanese scores of Sonic CD in the only way they know how. Lo and behold, Temporal Duality: A Sonic CD ReMix Album is at long last available for public downloading! The three disc album covers the hedgehog’s epic journey across the time crossed zones of the Little Planet in both musical flavours, so whether you’re a fan of the Ogata/Hataya flare or in the mood for some Nilsen, Young, and Sterling, there is a little something for everybody in this fully rearranged soundtrack. You can nab the album yourself via the Temporal Duality webpage! Check out the history behind the project, read up on each artist’s thoughts behind their own track, and while you’re at it, nab the entirety of OCRemix’s Sonic themed albums (available on the site)! That being said, this release kind of puts me in the mood for a music marathon of sorts. With Sound of Speed – Sonic the Hedgehog, Hedgehog Heaven – Sonic the Hedgehog 2, Project Chaos – Sonic the Hedgehog 3 & Knuckles, and now Temporal Duality – Sonic CD, OverClocked Remix has just about chronicled the complete 16bit saga of the Sonic the Hedgehog series… I can’t help but wonder what entry they will cover next in down the line. On the side, I would also recommend nabbing tunes from the OCR forum’s Blue Bomber Blue Blur Collision Competition, if you’re in the mood for some Sonic and Mega Man music crossover goodness! If you have already download Temporal Duality, share your thoughts on the album in the comments! Favourite songs? Favourite artist? Good points? Bad points? Sound off down below! 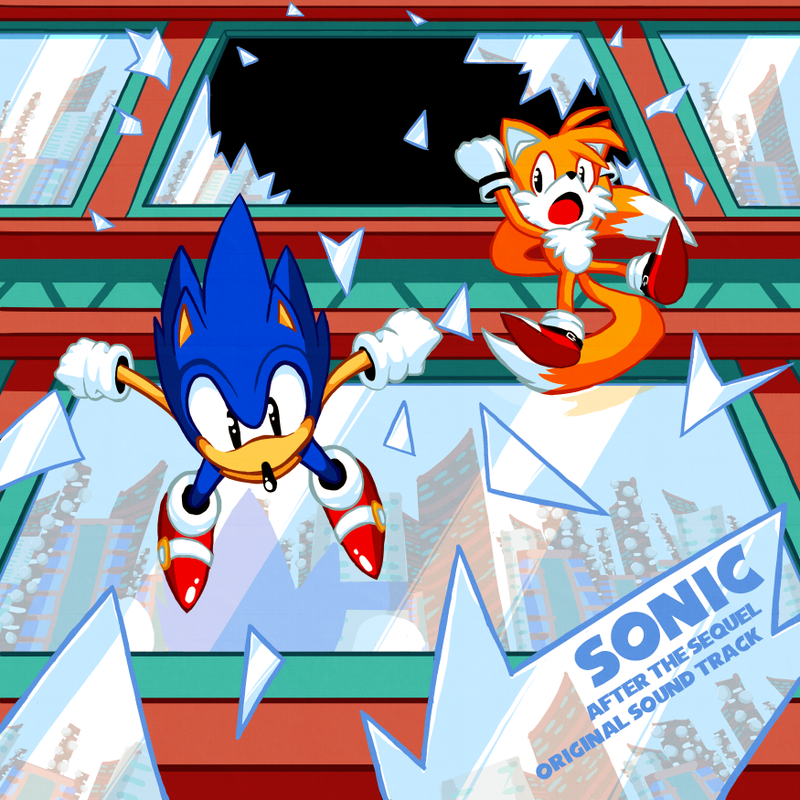 20 years ago today, Sonic CD hit the shelves of North America, following its Japanese release two months prior. The hit title that premiered recurring rival and robotic doppelganger Metal Sonic, alongside hammer-wielding valkyrie and blue believer Princess Sally Amy Rose, has been celebrated all around the community this year, predominantly through the Metal Sonic-themed Summer of Sonic convention featuring character designer Kazuyuki Hoshino. However, another Sonic CD tribute was in the works by way of the musical community at OverClocked Remix. 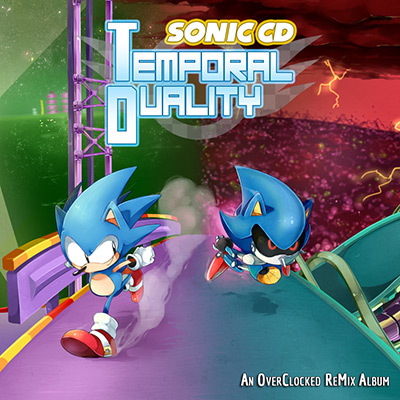 Seven months ago, the folks at OCRemix formally unveiled their 45th tribute album project, following the likes of Hedgehog Heaven, Project Chaos, and Sound of Speed, penned under the name TEMPORAL DUALITY: A Sonic CD ReMix Album. Founded by Rexy and led by SuperiorX, the album pays tribute to both American and Japanese soundtracks of the game, with the talented team behind the album rearranging the works of Naofumi Hataya, Masafumi Ogata, David J. Young, Mark “Sterling” Crew, and Spencer Nilsen! Now with the album’s official trailer out, it’s only a matter of time before its release hits! Stay tuned! If you’re interested in other OCRemix projects, the community recently released the Capcom-supported For Everlasting Peace: 25 Years of Mega Man, which you can purchase on iTunes and Amazon, as well as pre-order a physical copy. Highly recommended if you’re a fan of the other little boy blue! UPDATE: The marathon will be going live at 9am Pacific/12pm Eastern over at the event website, on Twitch.tv, and on YouTube. Original post follows. 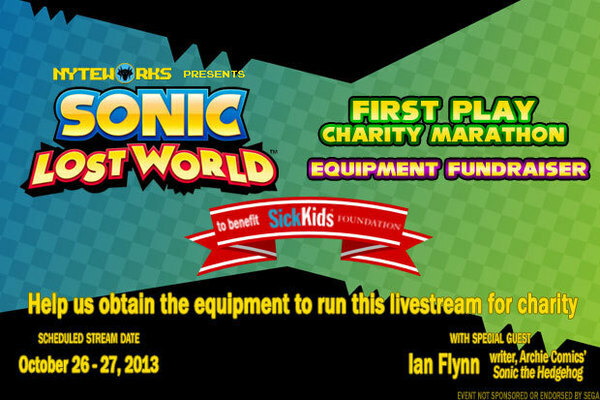 Along with the successful funding for effective livestream equipment, David Oxford of Nintendo Force is pleased to announced that the Sonic Lost World First Play Charity Marathon will forge ahead this Saturday, October 26th! Oxford will be joined by Ian Flynn, who many will recognize as the writer for Archie Comics’ Sonic the Hedgehog, Sonic Universe, and Mega Man series, as they tackle Sonic’s latest gaming venture over the course of 24 hours in hopes to raise money for the Sick Kids Foundation. 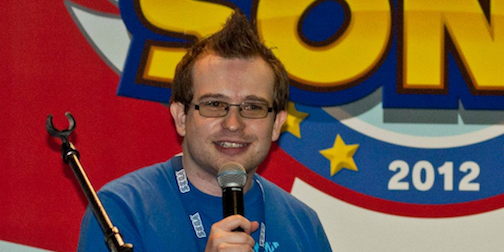 With the hosts themselves bearing little to no experience of the game itself, Flynn having played no more than the San Diego Comic-Con demo and Oxford going in blind, they will also be holding an open chat where viewers are given the green light to ask questions as the playthrough goes on, and with the recent universal reboot of the Archie Sonic comics following the mega Worlds Collide crossover, there is possibly no better chance to get some answers regarding Sonic’s brave new world than this! Four hardcover first editions of UDON Entertainment’s The History of Sonic the Hedgehog book! And the two grand prizes? One customized Sonic Lost World “thank you” illustration, featuring the winner’s name, by fan-favorite Sonic the Hedgehog and Mega Man artist Patrick “Spaz” Spaziante! One Wii U Deluxe Set from Nintendo with a copy of Sonic Lost World! While concerns were initially raised over the date of the event due to the delay of the North American release, it appears that the kind folks at SEGA have given a helping hand to Oxford and Flynn by granting them an early copy of the game, thus allowing the charity event to proceed as planned. Oxford and Flynn are hoping to raise a total of $1000-1500 through the Charity Marathon, and if those numbers can be broken, then all the better for Sick Kids! Help kick off the holiday season right by donating to this wonderful cause! 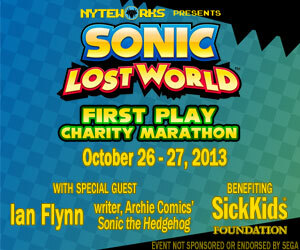 Once again, the Sonic Lost World First Play Charity Marathon will be held this Saturday, October 26th, over at Nyteworks. Like many of us, I was disappointed to hear that Sonic Boom was heading to St. Louis. I can totally understand though. Many Sonic fans back East miss out on these things. As a Southern California native, I’m lucky enough to go to events like E3, Comic Con and have an annual pass to Disneyland. So I was happy that people in the mid-US got a chance to enjoy some Sonic fandom, but still, many in other US regions feel left out. So now, Sonic meet ups are starting to spring up in a few states. The first of them is the Sonic Boom US West Chapter (to be called Sonic Revolution next year). Was it a homing attack hit or a Death-Egg disaster? Read on. David Oxford, writer for Nintendo Force magazine, and Ian Flynn, writer for Archie Comics’ Sonic the Hedgehog, Sonic Universe, and Mega Man series, are teaming up for a start-to-finish blind playthrough of SEGA’s upcoming Sonic Lost World to raise some money for charity! Hosted by Nyteworks, the pair seek to raise $1000-1500 (but you know what they say: the more, the merrier!) over the course of 24 hours for the Sick Kids Foundation, the fundraising branch of the Toronto-based The Hospital for Sick Children. You can pester Flynn with various questions concerning the comics, participate in raffles to win prizes via known sponsors Nintendo Force and UDON Entertainment (publisher of The History of Sonic the Hedgehog), and even request games to be played should they finish their Lost Hex romp early! HOWEVER! While the mission in itself is noble, they won’t be able to accomplish their goal without the proper equipment. Please think of the sick children. That’s right, I’m guilt-tripping you. Is it working? Yes? Good! 11th SonicLondon Meet This Saturday! It’s that time of year again for folks in the London area! This Saturday, our friends at SonicLondon will be hosting the group’s 11th meet-up in order to have a grand old time ’round all things gotta, go, and fast. If you’re in town and want to join in on the fun (provided you’re of age), you can RSVP now on the event’s Facebook page if you haven’t done so already! With partly cloudy skies expected, two plans of action have been prepared. If you’re going, read and revise ’em both, and start packing the essentials! The group will meet outside the Cow and Coffee Bean coffee shop in the middle of Regent’s Park between 1:30 – 2. From there we will travel to a picnic spot nearby (which we will decide as a group on the day), where we will sit and chill out. There will be a number of activities through-out the course of the day, such as the return of Sonic Black-jack and more to be confirmed. The group will meet in the Royal Festival Hall foyer area just past the Festival Terrace entrance between 1:30 – 2. Unlike previous meet-ups where we’ve left the Royal Festival Hall and headed straight to Namco, I thought it would be nice if we stuck around the RFH for a while this time… We’ll head to the upper floors and check out the breath-taking views. Expect any and all activities planned for Plan A to also take place here. ~ Money (again ; for afterwards). Summer Of Sonic Documentary now released! Every year since 2008, the Sonic community have come together to bring it’s fellow Sonic fans a place where they can play new games, meet their idols and finally meet people face to face. This is an event that means so much to the staff here and we are always looking at ways to share that with a wider and wider audience. This leads us to this years Summer Of Sonic Retrospective. Our annual documentary celebrating the years festivities. We hope it sheds some light to those around the world, why we love Summer Of Sonic so much, and acts as a memorable souvenir for this years attendees. Edit: Some people have said the video isn’t showing. Please click here if thats the case. For travelling details to those attending, don’t forget to consult the travel page on the SoS’13 website. 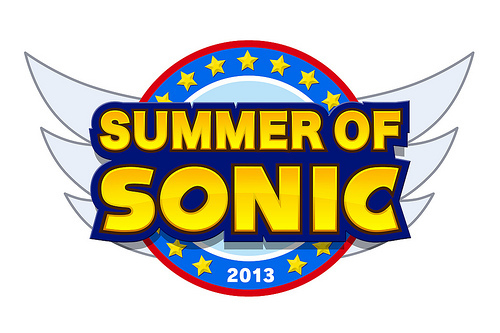 Tomorrow is the day the 2013 edition of Summer of Sonic is held, and fans on and offline are already feeling the hype! Be it meeting with Metal Sonic’s creator Kazuyuki Hoshino, watching community animation premieres by Frobman and Sonic Paradox, feeling the energy of the crowd during various performances, bagging some goodies, winning prizes, or simply enjoying time together with swathes of fellow fans, everyone has a reason to look forward to this day! The complete schedule to the event can be read below, taken straight from the SoS’13 webpage, though keep note that it is in British Standard Time. Those unable to attend can keep track of the day’s events through either watching the YouTube live feed, courtesy of The Sonic Show, or tuning in to RadioSEGA. The live feed can be viewed from either here, RadioSEGA, or at Sonic Paradox, the latter featuring commentary by SSF1991. Doors will open at 10:00, and the convention officially kicks off at 11:00 at the Main Stage area, giving you plenty of time to enter the venue and prepare for the day’s events. Summer of Sonic 2013 will finish at 19:00. A programme of the main events will also appear on your official Summer of Sonic Programme Guide, given to all attendees upon entry, so you don’t need to print this page off. Please be aware that, as this is a public and publicised event, you may be filmed and/or photographed during the day. Never Mind the Buzzbombers once again returns to Summer of Sonic! Two lucky audience members will be given the chance to win prizes whilst hanging out with some of the Sonic scene’s coolest celebrities! Rory ‘Roareye’ Joscelyne and Adam ‘T-Bird’ Tuff will do across a universe of Sonic-themed challenges with special guests Jun Senoue from Sonic Team and Tim Spencer from Sumo Digital. The Megadrive Band will be taking the main stage by storm this year as our midday musical act! Expect a repertoire of songs from yesteryear including an array of Sonic tunes we’ve come to know, along with many other Megadrive classics. If you’re into your retro, you’ll not want to miss this! Metal Sonic and Amy Rose creator Hoshino-san will be appearing on the main stage to answer some of your questions about his many years as a character designer at SEGA. Learn everything you wanted to know about the creation of the worlds and characters of the Sonic the Hedgehog and NiGHTS franchises! The Head of Sonic Team Takashi Iizuka will be joining us again on stage to learn more about the franchise we all love. Fans can ask their most burning questions to Iizuka-san, as well as gain insight into past and future Sonic games. 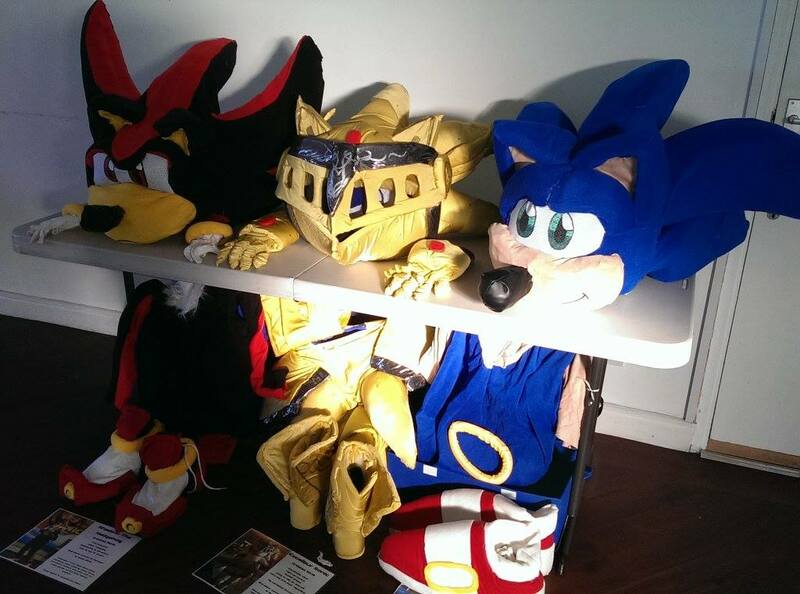 Those who have a passion for cosplay will be able to show off their creations at the Summer of Sonic event! Not only will you have an opportunity to impress other event-goers, there are prizes to be won for the best costumes on the day! To enter, head to the Cosplay Desk where we can take your name down and take a photo of your costume. After entries close at 14:30, the judges will look at all entrants and select the final ten to be judged on stage! 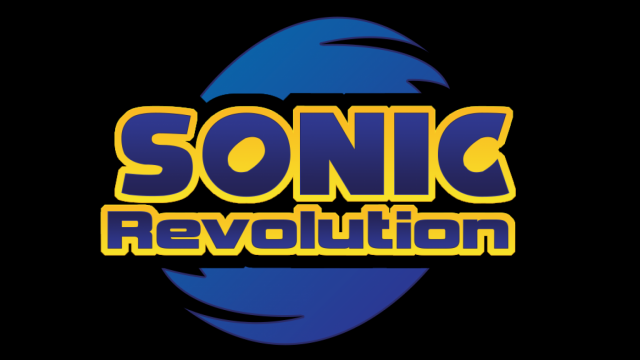 The Summer of Sonic is once again proud to present a collection of fan animations at this year’s event! BoozermaN has once again returned to create a special animation to open our show, and Frobman, the creator of Sonic in Brief, will be bringing some new chapters in the saga. Sonic Paradox will be continuing their musical adventure through Sonic Heroes with Metropolis Mayhem. Look out for some surprise animations too! Closing the show this year will be legendary Sonic sound director Jun Senoue, who will be playing hits from Sonic’s huge back catalogue of catchy game music. Following the success of last year’s Jam with Jun, Senoue-san will once again be accompanied on stage by two of the community’s most talented singers, Susie Brown and Daniele Narducci, to perform a number of vocal tracks. Comic fans rejoice! We have an entire zone at Summer of Sonic where you can chill out and revisit the stories and art of Sonic the Comic! Nigel Kitching (writer, artist), Ferran Rodriguez (artist) and Nigel Dobbyn (artist) will be available at points throughout the day to meet for chatting to about the industry and their time with the series. You can also meet the guys behind the Sonic the Comic: Online and join in the 20th anniversary celebrations of STC. The latest Sonic the Hedgehog games are ready and waiting for you to play! An entire wall of our convention hall is dedicated to video games – the medium where it all began for the blue blur! We will have a number of consoles ready and waiting for eager attendees to try out Sonic Lost World, as well as a number of mobile devices to play some of the current portable Sonic titles. Our special guests will be spending some time meeting and greeting fans throughout the day – if you want an unforgettable experience, come along and say hello to the men behind some of your favourite Sonic memories. To make the day as comfortable and enjoyable as possible for everyone, there will be some rules applied to the Signing Desk. Please make sure you read these, linked below, so you are not disappointed on the day! Sonic fans love to draw the blue blur almost as much as they like to play as him! Luckily we have loads of tables at Summer of Sonic 2012 so that you can sit down and scribble your favourite characters to your heart’s content. Some pens, pencils and paper will be provided but if you want to bring your own material that is fine! There will be a special seating area for parents to chill out while you do your thing, too. An art contest will run throughout the day, and prizes will be handed out on stage to the best pieces of art in an Under-15s and Over-15s category. To enter, your art piece must be drawn from scratch at the Summer of Sonic convention on Saturday, and not prepared in advance. Nigel Dobbyn will be hosting two Art Masterclass sessions throughout the day. Nigel will be sharing their knowledge with a small group of keen fans looking to build on their skills, using past works and live tutorials. Each Masterclass will run for 60 minutes, with each session accommodating a limited number of people. Entry into the Masterclass will be done on a first-come, first served basis, so if you are keen to join this session, make your way to the queue well in advance – when spaces are all filled up we will put out a sign so you’re aware of any full booking. You’ve enjoyed the convention, so why not take home a memento of the day so that you can treasure it forever? 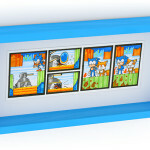 Official Sonic Merchandise will be available for purchase, including exclusive t-shirts, toys and other items. 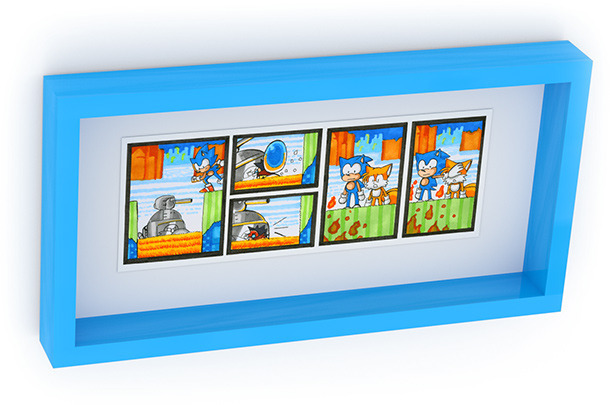 Some items will be things that you’ve always wanted but never had a chance to get until now; others will only be available at Summer of Sonic 2013. Be sure to also check out the new First4Figures prototype statues on display in the merchandise cabinet too! 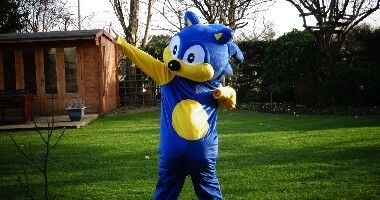 Always wanted to meet Sonic the Hedgehog in person but only dreamed about it? 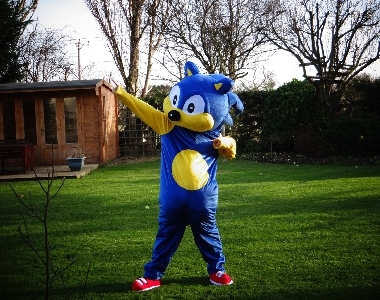 Well, you’re in luck – the blue blur is never one to miss a party, and the Summer of Sonic is no exception! Keep an eye out for the spiny hero around the Main Hall at the above times – be quick and you might just get a photo and a hug from Sonic! The venue in Westminster includes a café on the lower floors, catering for those of you who would prefer to remain in the building throughout the day. The café will be offering a selection of snacks and beverages, hot and cold, including sandwiches, baguettes and burgers, hot pies and pastries, crisps, confectionary and cakes. Soft drinks and hot drinks are available. No alcohol is permitted within the venue. By entering the event premises, you consent to interview(s), photography, audio recording, video recording and its/their release, publication, exhibition, or reproduction (the “Recording”) to be used for any purposes, including but not limited to news, web casts, promotional purposes, telecasts, advertising, inclusion on web sites, or any other purpose by Sega, its officers and employees, its affiliates, and representatives (“Sega Entities”). You hereby release the Sega Entities from any liability connected with the taking, recording, digitizing, publication and exploitation (commercial or otherwise) of the Recording. By entering the event premises, you waive all rights you may have to any claims for payment or royalties, including but not limited to the benefits of any provision of law known as “moral rights” (including without limitation under Sections 77 to 85 inclusive of the UK Copyright Designs and Patents 1988 Act) or any similar laws of any jurisdiction, in connection with any use or exploitation of the Recording. You also waive any right to inspect or approve any photo, video, or audio recording taken by Sega Entities. Get your headphones on boys and girls, cuz this one’s a bit hard to hear otherwise. Alex and I were in attendance at the Sonic/Megaman panel at the San Diego Comic Con Sunday and managed to get footage of the Q&A portion of the panel using Alex’s super nice HD video camera (somebody turn me into a sammich ‘cuz I’m jelly of that thing). There were tons of fans in attendance including some awesome cosplayers including an awesome Eggman and Sally. If anyone can hear this well enough to transcribe it, I’d gladly add it in later. 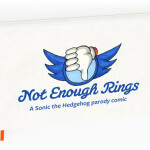 Fans and supporters of Veronica Vera and Oliver Bareham’s Not Enough Rings webcomic will be pleased to know that the Kickstarter raised to fund a physical release of the complete parody series has been covered – and then some! With the initial goal pitched for $6500, the total went for about triple, reaching $17778 in funds over the past month. With that much money raised, the Not Enough Rings Kickstarter has met the two stretchgoals Vera set forth – hardcover and blue page edges. Final design of the book can be viewed below. 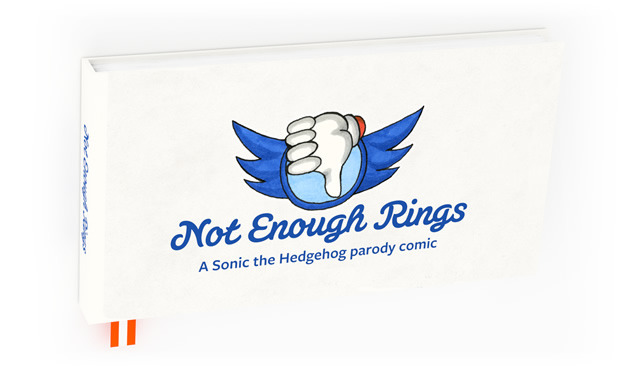 The 355 Not Enough Rings backers who pledged a minimum of $25 will receive the book, cataloguing the entirety of the webcomic before it reaches its end online as well as bonus comics entailing the Sonic 3 Competition Stages, and a full PDF download of the series. Those who pledged more would obtain the Carnival Night barrel Time Over shirt, a signed copy of the book, the Upstage card game based on Vera and Bareham’s Bittersweet Candy Bowl webcomic, a framed Not Enough Rings strip of their choice, and a custom strip based on any Sonic stage. 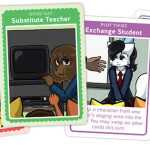 Estimated delivery of the Kickstarter pledge rewards is set for September of this year. I have been asked to post the following on behalf of everyone at Summer of Sonic. In order for us to accomplish these goals, every year, SOS staff have had to put their own money into the event in order to make sure it runs as smoothly as it can. Sometimes this money goes towards small things; things that you would never think have been paid for by staff, such as props or various items that we use for stage events or to make items that you see around SOS. To much larger things, like ensuring we can get certain people to attend in order to make the event very special. But we have a limit, and we’re quickly approaching it. This is why we’re now asking you for help. Please don’t get the wrong idea, SOS is still happening, it’s free, and there are still some very big announcements to come. But, we need some help. We’ve avoided trying to ask you for help, but, it’s come to the stage where we have to ask you for help. A number of people have generously asked us if they could support the event in some way, with the form of donations. First of all, we’d like to take the time to thank these people for their kindness, even the gesture of asking us if they could help blew us away as we were not expecting it. With that in mind, if you wish to donate to SOS, please visit our paypal donation page where you can donate to the event. Anything donated will go directly into this year’s event in order to help us our secondary goal, to do something extra special. Thanks for reading, and see you on August 3rd. The Summer of Sonic Team. “SpecialEffect is a charity that targets something that often gets overlooked – that people with disabilities have lives beyond simply ‘being disabled’ and want to enjoy themselves. The charity, the only one of its kind in the UK, provides the specialist technology, advice and support for everyone to benefit from the fun, friendship and inclusion of video games. Praised by Prime Minister David Cameron as “providing magic moments all the time“, SpecialEffect been making a profoundly positive impact on the quality of life for children and adults of all ages since 2007. At any one time the charity is working with and helping up to 500 people on an intensive basis in hospitals, hospices and at home. They also influence the lives of thousands of people each year with support, advice and hands-on demonstrations at their award-winning games roadshows. Their help includes the loan and support of mainstream and adapted access equipment for online and offline games. Some of the specialist equipment, like eye-control technology, is expensive, so the loans enable people to make sure it’s suitable before they commit to a purchase. The charity doesn’t sell any equipment, so their advice is always impartial. So there you have it. As well as having some fun and some laughs, we’ve got a really good chance to do something awesome at this years convention. [UPDATE: WINNERS!] Summer of Sonic Ticket Competition! Your tickets will be issued shortly! If you weren’t successful in snagging a Summer of Sonic ticket last week, then all is not lost! We have 10 pairs of Summer of Sonic tickets to give away to some very lucky people! All you have to do is answer this very simple question: The first Summer of Sonic convention took place in 2008, but which year did Summer of Sonic start as an online celebration of all things Sonic? You will have to be quick however! Our competition will end TOMMOROW at 7pm (Wednesday, 10th of July, 2013) so get your answers in quick! Winners will be notified by email. As you know, Summer of Sonic is a free event, but a lot of the little extras are paid for by the Summer of Sonic staff. Because of this, many of you have generously expressed interest in donating to the cause in the past. If you wish to donate, you can do so easily by visiting our paypal donation page. Any donations will be gratefully accepted. Good luck, and see you on August the 3rd! The Summer of Sonic website has announced the return of the Cosplay Competition, details are as follows. “We take great pleasure in announcing the return of a fan favourite event to Summer of Sonic 2013: the cosplay contest! Do you possess the speed of Sonic? Do you have the tech skills of Tails? Or perhaps even the ego of Eggman? No matter who your favourite character is, we’d love to see all you cosplayers out there showing off your creations at the event! Each year we are blown away by the caliber and variety of cosplayers at Summer of Sonic, and we hope that this year will be even bigger! Once again we want you, the audience to help us judge the competition! Just like in previous years, we want you to cheer (preferably as loud as you can!) for your favourite costume on stage; remember, those cheers equal all-important points for the participants! If you want to enter the contest, you will be able to sign-up from opening time; don’t worry, we’ll make it’s easy to find! You will be given a group number upon sign up. At 2:30pm signups will close, and the group elimination stages will take place with the best costumes from each group going through to the final. The final ten cosplayers will be called to the stage later in the day, where the overall winner will be announced! We will announce when and where each group is due to gather, so keep hold of your number and come along when we call you! We will have some fantastic prizes for the overall winner on the day, so we hope to see you guys pull off some amazing get-ups! Also, we’d like to take this time to remind you, the second wave of tickets for Summer of Sonic go live in just over 1 hours time. Remember, you cannot enter Summer of Sonic without a ticket, so if you still want to go, this is your last chance to get tickets. Good luck everyone, hope to see you there. Tickets are only available via this link. (or, go to the Summer of Sonic website and click on the ‘Tickets’ link which you can see just under the picture of Metal Sonic). At 18:00 British Summer Time, (which is one hours time. from the posting of this article,) 450 tickets will be released. On friday, 450 went in 6 seconds. So be quick. Tickets are free. Finally, I’m posting this because some people have been asking, this is Summer of Sonic’s only facebook page. cosplay competitionSOS 2013summer of sonicTicket Wave 2. SOS 2013 Event Announcement: Never Mind The BuzzBombers! “Who wants to win some prizes!? As we enter our 6th year of Summer of Sonic, Never Mind the BuzzBombers returns for its 5th instalment. Always a fan favourite, two captains will lead their teams to battle as they clash in a variety of games and challenges. But they won’t be alone; members of the audience will be selected to join them on stage in order to win some amazing Sonic prizes! So if you think you have an encyclopaedic knowledge of Sonic, make sure you get down to the stage during selection process and you could be the one who turns the tide in your team leader’s favour. And as always, I shall be standing… because we don’t have enough chairs… between them both mocking and maintaining order, doing a dance, telling a story, asking a barrage of questions until they can’t take anymore as we attempt to find out just who is the best? This is Never Mind The BuzzBombers 2013! Want to be apart of BuzzBombers? Be sure to be at the stage area when we start so you don’t miss your chance to be recruited into one our two teams. Source: Summer of Sonic Website. Wave 1 of SOS tickets sells out in 6 seconds! Blink, and you probably did miss it! Following the amazing demand of last year, everybody knew this years first wave would go quickly, but nobody expected it to go this quickly. 450 tickets were up for grabs and they all sold out in 6 seconds! If you got your tickets odds are you’re wiping the sweat of your brow right now and thinking something along the lines of ‘Oh man! I got lucky!’ However if you were unsucessful, do not despare, the second wave of tickets will go live this Sunday 7th July at 6:00PM (BST). There will be another 450 tickets up for grabs. If you didn’t get a ticket this time, think of it this way… 450 less people attempting to go for tickets. See you on Sunday, good luck! For more announcements and news on ticket updates, keep checking the SOS website and TSS. 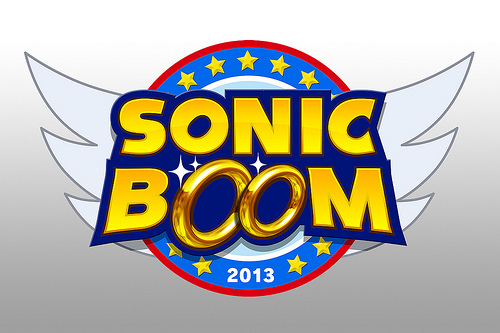 Sega have announced on their facebook when tickets for Sonic Boom 2013 will go on sale. And thats it. No really, thats all the details they gave! I have no idea on price, where you can get them from or how many will be available. Of course I’ll update this with more information when I get it, until then, keep checking the Official Sonic Boom facebook page and Sega Blogs for more information when it’s posted. In 2008, when SOS was held in a place called ‘The Dragon Hall’ it was situated directly opposite a pub. A lot of the staff and many of the guests at the time joked that ‘nobody but the drunks over the road would turn up!’ It seems amazing to think that with more than 3 times the capacity of the Dragon Hall, last year, it took less than 3 minutes for all the tickets to be sold out. With that in mind, this is probably one of the most important announcements if you want to attend this years event. The Summer of Sonic website has published the details of how tickets will be distributed this year. Here is what you need to know. There will be two waves of tickets. There will be 450 tickets in both waves. Furthermore, the ticketing system this year has altered too, you now get to select how many tickets you want, (maximum of 4). Before you fill out your details. So you won’t have to race to fill out a form and then click submit and be disapointed if all the tickets for that wave have gone. Booking tickets is done via the SOS website, at this specific link. Authors Note: I shall update this with more specific details as and when I get them. If it’s anything like last year, tickets are expected to sell out very quickly. Please be online and ready before they go live in order to avoid disapointment. See the SOS website for more details. SOS 2013 is held on August 3rd at the Methodist Central Hall Westminster in London. 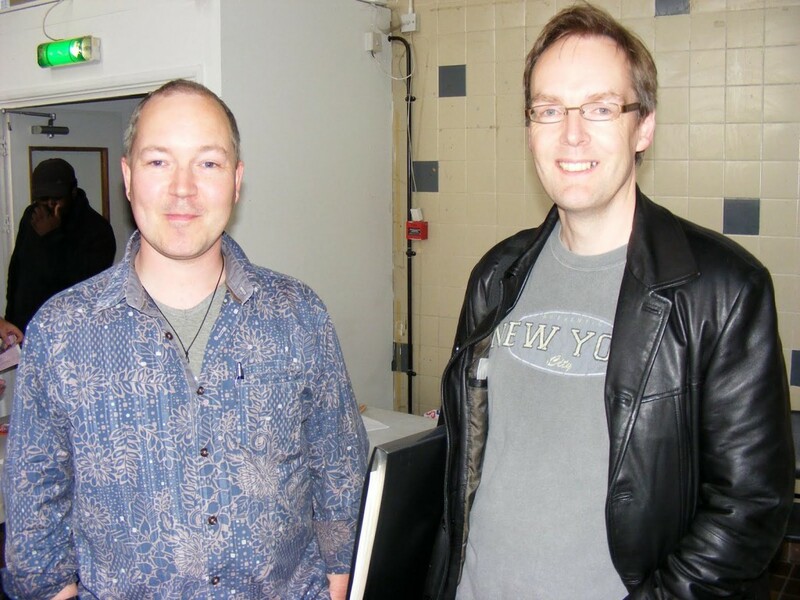 The Summer of Sonic website has made it’s first guest announcement, Nigel Dobbyn & Nigel Kitching will be returning for this years event. 2013 will mark the 20th anniversary of Fleetway’s Sonic the Comic, first published back 1993, so if you are old enough to remember walking into a newsagent and picking up issue 1 with those stickers on the cover, why not come meet two of the main reasons as to why the comic became so popular and ran for as long as it did? Both Nigels will be at a meet and greet session at the signing booth and art classes will be happening this year too, details will be announced at a later date. Furthermore, the art corner will be returning to SOS this year, so if you fancy putting pen to paper and wowing your fellow fans with your art skills, they’ve got you covered. 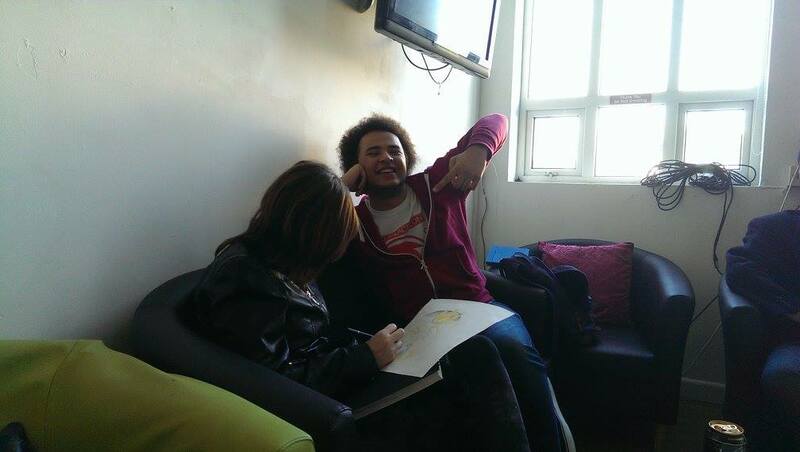 As with previous SOS’ there will be prizes given out, thats right, the art competition is also returning. For the full story, check out the SOS website if you havn’t already done so. Summer Of Sonic 2012 Recap! With a year gone by and a new day of events and memories right around the corner, why not look back at last year and remind ourselves what makes this event so awesome! In a brand new video using footage we shot last year, we hope this lets some of you reminiscence about the greatness that is our community! It’s like a day full of awesomeness squeezed into two minutes and jet blasted back into our conscious. Are you pumped for this year’s big event? After five amazing years of creating and organising the world’s best-loved Sonic the Hedgehog fan convention, I have decided to retire my position from The Summer of Sonic team. Effective immediately, I will have no involvement in the organisation of 2013’s event. I have passed my duties and responsibilities in developing the convention to Adam Tuff (T-Bird) and Rory Joscelyne (Roareye). Having been key members of the Summer of Sonic team since its very first year, I have no doubt that they will continue to realise our vision for the show, and put on an amazing day’s worth of fun for Sonic the Hedgehog fans all over the world. The Summer of Sonic convention is an event that will forever remain incredibly dear to me. I would like to thank everybody who’s ever been involved with the show’s development – volunteers, special guests, our collaborative partner SEGA and of course the fans that have attended and helped transform it into the international success it is today. We know video game webcomics are a dime a dozen. Especially Sonic ones! But in all our years on the internet, we never came across the comic we wanted. No sprite recolors, no tribal Echidna warriors, definitely no werehogs — just a real comic retelling of the remarkable games we grew up playing. 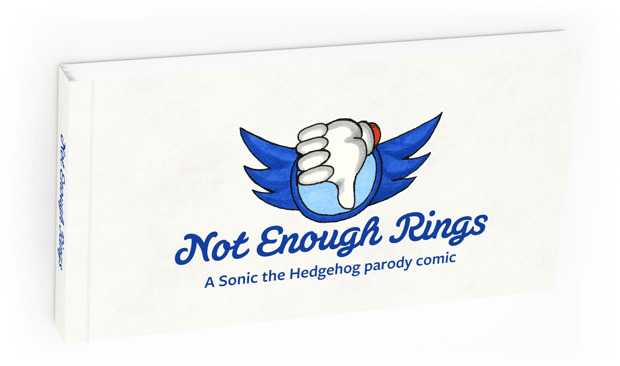 And the Not Enough Rings webcomic (which you can read at your own leisure), spoofing the Genesis saga from Green Hill all the way up to the Doomsday Zone, is nothing short of the latter. 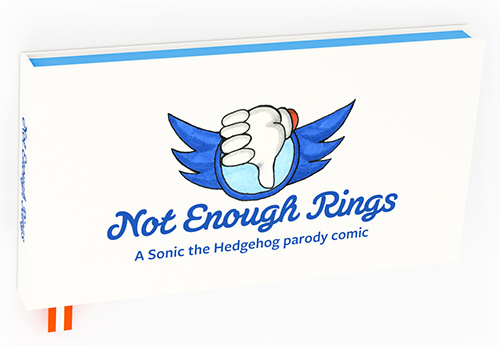 Veronica Vera and Oliver Bareham, the duo behind the affectionate Sonic the Hedgehog parody webcomic, are hoping to bring their work into print form, with a Kickstarter page gone live since yesterday. Going for a minimum goal of $6,500, the Not Enough Rings Kickstarter has already reached $5,300, and is open for donations up until July 19th! Supporters can nab themselves a copy of the 106-page comic for as little as $25, but shipping will cost extra for those outside of the United States. Extra rewards include a signed copy of the book, a TIME OVER t-shirt featuring the Carnival Night barrel, a framed strip from the comic of your choice, advance copies of the Upstage card game for Bittersweet Candy Bowl (the duo’s main project), and if you’re downright insane, a Not Enough Rings-esque strip of any stage of any Sonic game of your choosing! 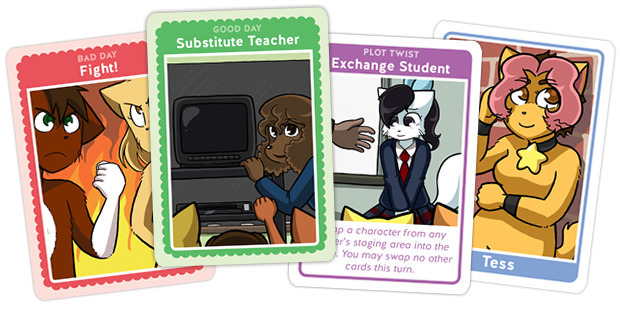 The only stretch goal to this project is to cover the funds to upgrade the books themselves into hardcover copies, the goal itself being a now realistic $10,500. Perks of supporting this project also include reading the already completed webcomic before it’s been fully uploaded online, as well as strips dedicated to the Sonic 3 Competition stages – BOOK EXCLUSIVE. Now THAT is a good deal. That being said, head on over to the Kickstarter page and help this labour of love come to fruition! Oh yeah, folks. It’s happening. That three-way collaboration between Sonic Radio, RadioSEGA, and our own SEGASonic:Radio, is happening this Sunday. 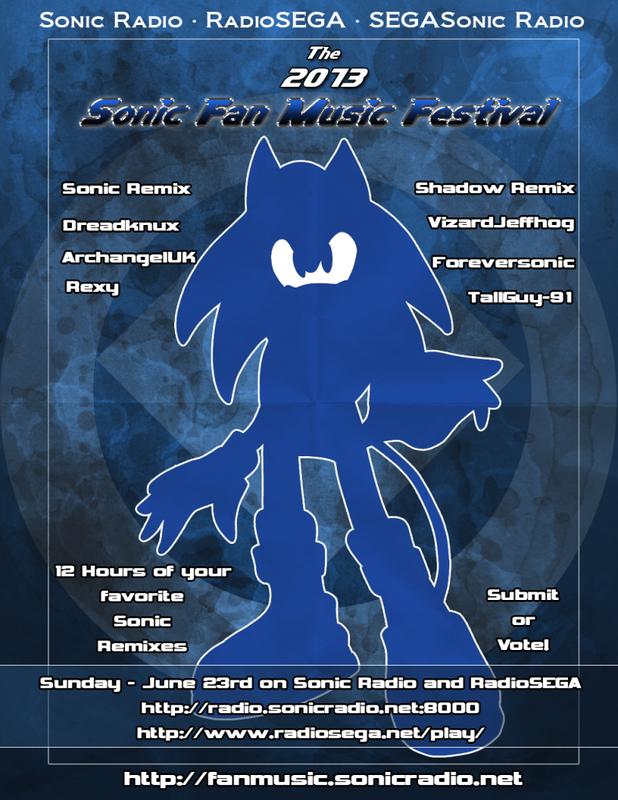 Hosted by Sonic Radio, the Sonic Fan Music Festival is gunning for its second year this 2013, right on June 23rd! Join us for a birthday bash to remember as we dedicate 12 straight hours of remix goodness to Sonic’s 22nd anniversary! That being said, The Music Plant Zone and A/V Hijack won’t be airing on their regular timeslots this weekend (consult SS:R schedule here). The Music Plant Zone will be airing at the time written above this June 23rd on Sonic Radio; we’ll see if we can get a relay of the festival onto our stream, but just in case, tune in to Sonic Radio! Meanwhile, the upcoming A/V Hijack broadcast has been delayed to next Sunday. If you have plans this Sunday, cancel them! …unless this is one of your plans this Sunday, don’t cancel that. Okay? Cool! Cool. Following the release of the game a few days prior, the famed fan-made original soundtrack to LakeFeperd’s Sonic After the Sequel is now available to the open public! Featuring the combined works of artists Falk, Funk Fiction, James Landino (KgZ), and Andy Tunstall (Ristar/Tunners) of Before the Sequel 2012, along with newcomers Mr Lange, DJ Max-E, and Li Xiao’an, the incredible seven-man album clocks in at a total of 76 tracks! Be warned though, this 3 and a half hour beast of sound does go for about 420MB. To those who’ve played the fan game and/or stalked the artists on Soundcloud, what are your favourite tunes from the OST? Landino’s blood-pumping Breakfast Time for Horizon Heights’ boss? Falk’s jazztacular Tea With Ellie for Cyan City? Lange’s tropical Turquoise Paradise of Foliage Furnace with nods to the Sonic OVA? Funk Fiction’s club-worthy Rocks Like This for Technology Tree? Tunstall’s spine-chilling Ghosts With Guitars for Moon Mansion? DJ Max-E’s frosty Neon Paradise for Parhelion Peak (…wait, that one sounds familiar…)? Or even Li’s harrowing Eye of the Storm for the final showdown? The Special Stage themes with remixes to Sonic Drift 2, or even Sonic R? Cutscene music? Share your thoughts down below! In any case, you can either download the complete OST from the game’s website, or listen to it all on the music’s official YouTube channel. This is definitely a soundtrack worth looking into!